Being in Iraq, it's easy to forget about what's going on in the News back home. My old home State of California took a beating this last week. Terrible to see the images of places I've lived at or had friends live at burnt to the ground. Terrible, and sad. Yet my old home State shined last week. Emergency services worked like clock-work. Cities pulled together to help their residents in need. Everything and everyone pulled together to overcome this tragedy. 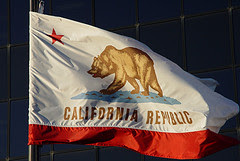 It's rare to have pride for California, especially in this political and social climate. But every now and then she shines, showing her true self as the greatest State in the Union. While FEMA stumbled as usual, and was busy holding fake press conferences to make it look like they were actively engaged, the State took care of its own. While the press circled families who had lost everything, like vultures, and repeatedly tried to get leaders to place blame on Bush or Iraq or Cheney or Global Warming... etc etc, California and her people stood tall. 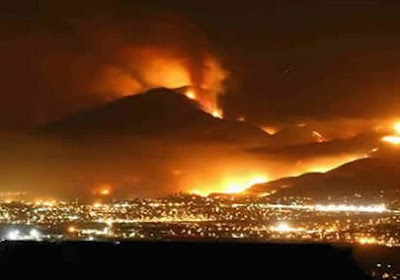 My heart goes out to all who have suffered from the latest Santa Ana fire storm in Southern California. Used to live, work, and go to school right where the flames are. Blue Skies will rule the day soon. 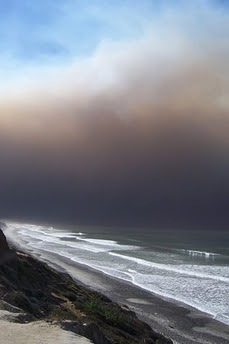 Back in 1970, we had our first taste of these CA firestorms. Not a fun time! Like you, I thought it was handled as well as it could be and the evacuees were seemingly civilized. I have some very uncivilized ideas for the arsonists, though!! Dang it! I hit "post" too soon. Hope your family and friends are doing okay. Hope your Cali folks are doing okay. I loved, loved, LOVED the governor's interview with Claire Shipman from Good Morning, America. She was all doom & gloom and looking for the "Katrina connection" and Arnold was, rightfully, having none of it. California, in this instance, has been a wonderful example of the American spirit in times of adversity. I'm very proud of how Californians came together this last week. A peek at blue skies here today, a bit cooler, and a few (a very few) rain drops just fell. Much better conditions for the firefighters to contain the remaining fires. What's infuriating to me is that they believe there were three arsons that caused all this destruction. What can you do to people who would do something like that? Prison? Death? Southern Cal did do the State proud, though. I'm flying to LAX tomorrow morning, window seat. I hope the damage isn't as bad as the news has made it out to be. Well said. It was painful watching SoCal burn and being so far away. I would have given anything to be out there to help. Some people out here in DC (ones that usually give me hell for being a Californian) mentioned that they were amazed at how orderly the evacuation was out in CA. All I could do was smile at them. We really are a great state. I couldn't agree more. The state and local governments acted quickly and very efficiently. All of the other states could take a lesson from California in emergency management.